‘Tis A Sad Day – Maureen O’Hara Dies At 95 – What Price Hollywood? Last year, I felt very honored and privileged to be able to attend an event at the Turner Classic Movies Film Festival – it was a screening of “How Green Was My Valley” and Maureen O’Hara was there! She did an interview on stage before the movie, which was hilarious (if you have a chance, check it out on the TCM site or YouTube). As you can see from the picture above, even at 94, she was still a very beautiful woman – and so striking with that red hair. Technicolor or not – she was stunning. She was my ideal of what an Irish woman looked like. Maureen O’Hara has always been one of my favorite actresses. I was saddened to hear that she passed away today at the age of 95 – surrounded by her family and listening to music from “The Quiet Man”. I love that fact – even if it is a bit of Irish propaganda. I think for me – despite all of the movies that I have seen her in – she will in some way always be Mary Kate Danaher. It’s one of those roles that is a perfect fit for the actress who played it – a fusing of the two – where you can’t really tell where one ends and the other begins. She is that character in some way. And it’s interesting that she always considered “The Quiet Man” to be her favorite film. It’s one of mine too – and every time I visit Ireland, I have to make a stop in Cong (the town they shot the film in). To me, that is what I think of when I think of Ireland. There will be many tributes in the days to come, I’m sure. She really was one of the greats of Old Hollywood – and appeared in truly some of the best movies ever made. But I also loved her no-nonsense attitude – and her stories! She had that Irish sensibility for storytelling – and true or not – she certainly could spin a good yarn. It made her that much more fascinating and in a certain way, relatable. She will be missed. So tonight, I will be watching “The Quiet Man” and tipping back a glass (or three) of Jameson – with a “Sláinte!” in honor of the Irish lass from the silver screen. 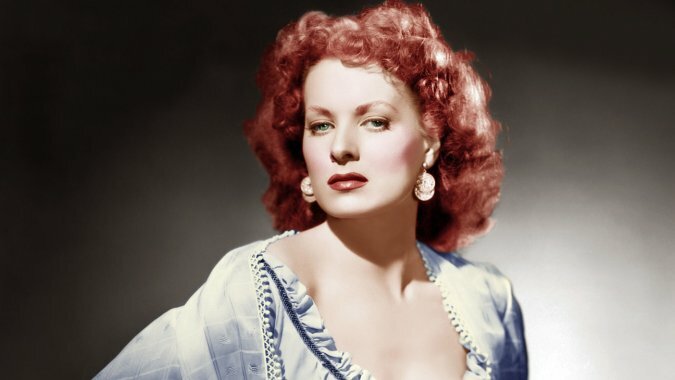 Maureen O’Hara, the Irish beauty whose striking red hair, crystal-green eyes and porcelain skin was so dazzling on the silver screen that she was dubbed “The Queen of Technicolor,” has died. She was 95. “She passed peacefully surrounded by her loving family as they celebrated her life listening to music from her favorite movie, The Quiet Man,” said a statement from her family. She moved to Idaho in 2013 to be closer to her children after spending four decades in Glengarriff, Ireland. O’Hara starred with Fonda again in the 1973 NBC telefilm The Red Pony and in 1991 made a return to the big screen, starring as John Candy’s overbearing mother in Chris Columbus’ Only the Lonely. (She said that Candy reminded her of Laughton.) Her last credit was as the star of the 2000 CBS telefilm The Last Dance. O’Hara was married three times, most recently to aviator Charles Blair, whom she wed in 1968. They had a daughter, Bronwyn. When he was killed in a plane crash in 1978, O’Hara continued to manage his commuter seaplane business, Antilles Air Boats, in the U.S. Virgin Islands and published Virgin Islander magazine. Earlier, she was married to producer George Brown from 1939-41 (that union was annulled) and director Will Price, who she said was an abusive alcoholic, from 1941 until their divorce in 1953.